Ben Vorlich rises high above Loch Earn with spectacular views in good weather. 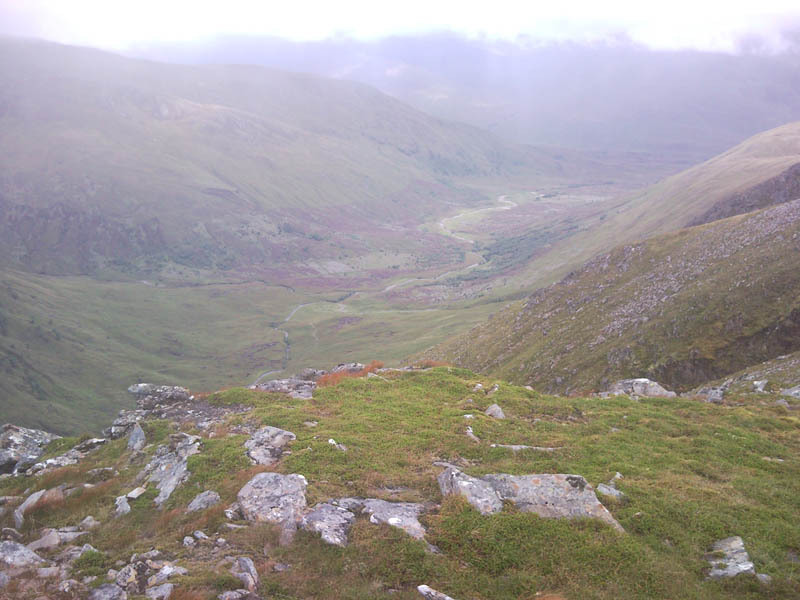 This Munro is usually walked with its neighbour Stuc a Chroin from Loch Earn. However care has to be taken on the steep scrambly ascent to Stuc a Chroin should you walk to the summit of both Munro’s. Again Danny and Keithy had invited me out for a hill walk. This time the plan was to Walk Ben Vorlich and Stuc a’ Chroin however due to severe weather conditions we only managed to summit Ben Vorlich. 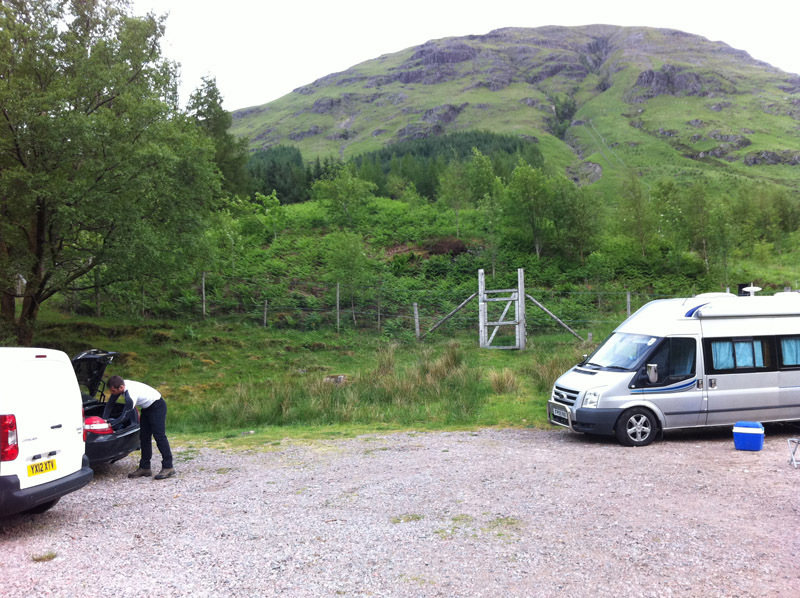 We drove up to loch Earn quite early and parked on the verge near the humpback bridge at Ardvorlich. The weather was overcast with the threat of rain or snow but that was not going to deter us on this occasion. We followed the road over the bridge to Ardvorlich House where a sign indicates the track to Ben Vorlich. We now follow the track for 2km and cross the burn coming down Coire Buidhe via a footbridge. It’s now pretty much a direct path for 600m up the ridgeline to the summit of Ben Vorlich. Unfortunately as we were ascending the weather was deteriorating with freezing rain and snow coming in from the East. At about 800m I pretty much couldn’t see anything, well not until I took my glasses off lol. My glasses had frozen over with a layer of opaque frost covering the lenses. Undeterred we pressed on and soon arrived at the summit. I had sweated quite a lot on the ascent and I decided to change my change my wet under layer in the slight shelter afforded by the cairn. That was my first mistake as my body cooled down rapidly due to the freezing conditions. Now I was dry but freezing hahaha. Due to the conditions a decision was made then not to attempt Stuc a ‘Chroin and to return the way we came. Being full of beans and slightly mad I decided to jump from rock to rock just below the summit. I was stepping on the rocks as they protruded from the slight snow covering around them and was thoroughly enjoying myself when disaster struck. As I put my left foot down on a rock my foot immediately slipped from the rock and I fell heavily coming down hard on my left thigh bone. The pain was excruciating. I was in shock for a minute or two but then gathered my senses and stood up. Danny asked me if I was ok and offered to carry my backpack but I was having none of it and immediately set off down the hill. In my mind I had to get off the hill as quickly as possible. I figured if I kept moving my leg it would be ok but it was a nightmare descent. I remember at one point hearing Keithy ask Danny “Will he make it down” so I knew that I must have been struggling badly and visibly so. After some time we were back at the car and I was feeling sick. The lads wanted to stop somewhere for a drink but I just wanted to get home so we headed back to Dunfermline. That was an interesting day for a number of reasons. We bagged one Munro. The weather was terrible and I didn’t really have winter walking gear. I also fell and took a nasty hit on my leg. It took my leg two weeks to recover from the fall. Looking back it was almost a case of being “casualty evacuated” from the hill. Mind you we did not have the winter clothes required and I would have most likely froze to death had I stayed on the hillside and waited for rescue so struggling down was the correct decision at the time.